"At night the soft winds weave through the palms letting out gentle sounds of a tropical paradise"
"The decor was inviting with rich textiles and a simple modern design"
Leading up to our stay at Two Bunch Palms, my husband and I were slammed with work. Hours upon hours spent on the computer lost in a digital landscape where images stitched an endless road. With no end in sight, a much-needed break was in order. We broke free from our digital haze at the serene resort of Two Bunch Palms. We arrived at night with windows down, soaking in the warm desert night. Immediately we were greeted by the Two Bunch Palms gatekeeper who was glowing with spirit and gave a wealth of knowledge about the property. Check in was a breeze with more lovely staff and we set off to room 3. 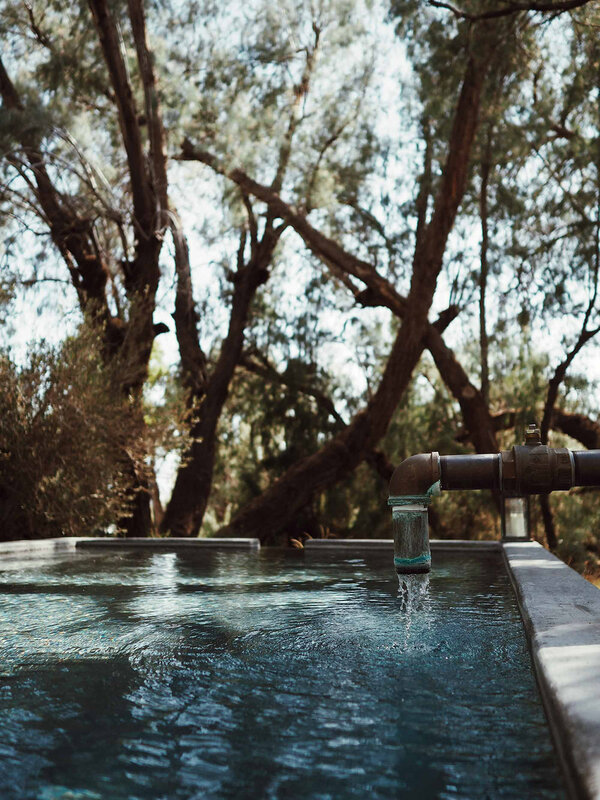 Immediately your senses are relaxed by the calming vibes of the property. At night the soft winds weave through the palms letting out gentle sounds of a tropical paradise. Room 3 was a perfectly located room just steps away from the mineral pools. The decor was inviting with rich textiles and a simple modern design. If you leave the window or door open you can lay in bed with the sounds of trickling mineral water. After unloading our things we immediately suited up for a dip in the mineral pools. We walked down a small tropical path, passing fire pits, and intimate seating areas which led to an incredible infinity pool. The water was warm and it takes a short time to get used to but when you do it feels like heaven. I was in a tranquil trance floating on my back and looking up at the trees lit by soft accent lighting. One of the best things about Two Bunch Palms is the adults-only policy which gives you the freedom to roam the property and swim in the mineral waters from 7am-5am. It's 3 am and you can't sleep? 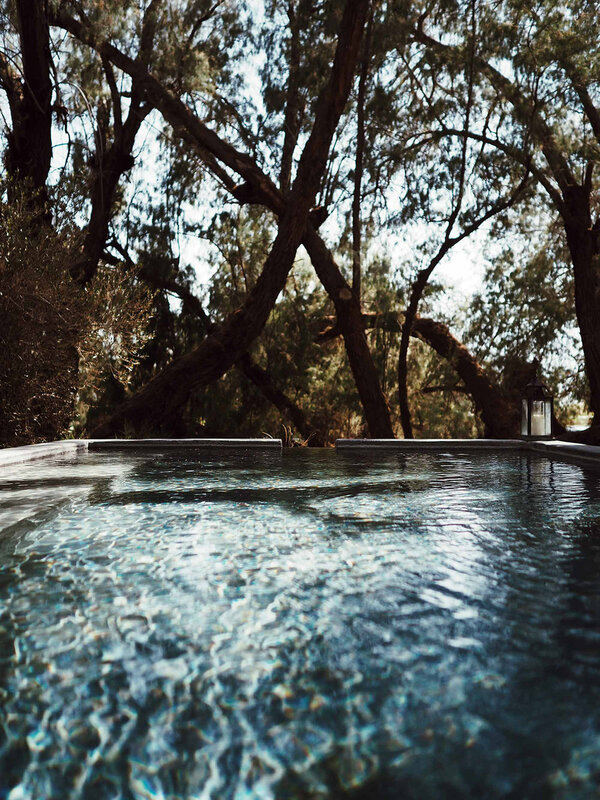 Take a mineral bath for a few minutes and you will sleep like royalty. After our dip in the healing waters and forgetting about our endless digital landscape we turned in for the night and it felt like we instantly fell into a deep sleep. We spent our days wandering the property, swimming, relaxing, shooting images, and eating at Essence which was an incredible dining experience. Essence has a menu that can provide for all eating habits which suited us very well. Something I really wanted to highlight about Two Bunch Palms is the wellness programs and spa treatments. The wellness programs are designed to leave you feeling grounded, calm, and fulfilled. The classes change weekly, ensuring a new experience each time you stay. You can choose from Chakras and Your Destiny, Discover Your Power Animal, Follow Your Drum to Your, Mind/Body/Soul, Gentle Yoga Stretch, Harmonic Vibrations Sound Bath, Slow Down to Get Ahead, Shaman Blessing Honoring Your Dreams, and Shaman Journey to Clear and Realign. My personal favorites are the Shaman programs. These are things you can't just get anywhere and it adds that much more serenity and peace to your stay. The spa programs are another aspect of Two Bunch Palms that are unique. This is a full-service spa and I was astonished at how many programs there are. The therapists and aestheticians bring decades of treatment experience which develop a deep connection to the spirit of the space. Our stay was an incredible experience and when the time came to leave we wanted to hide away in our room and never come out. Allass our adult responsibilities call us back to scrape our knees on the endless digital landscape but now we can hit the road with a clear head and a rejuvenated spirit all thanks to a quick stay at Two Bunch Palms.